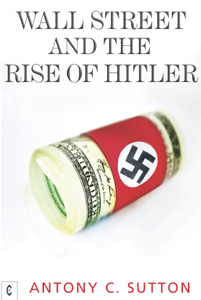 Penetrating a cloak of falsehood, deception and duplicity, Professor Antony C. Sutton reveals one of the most remarkable but unreported facts of the Second World War: that key Wall Street banks and American businesses supported Hitler's rise to power by financing and trading with Nazi Germany. Carefully tracing this closely guarded secret through original documents and eyewitness accounts, Sutton comes to the unsavoury conclusion that the catastrophic Second World War was extremely profitable for a select group of financial insiders. He presents a thoroughly documented account of the role played by J.P. Morgan, T.W. Lamont, the Rockefeller interests, General Electric Company, Standard Oil, National City Bank, Chase and Manhattan banks, Kuhn, Loeb and Company, General Motors, the Ford Motor Company, and scores of others in helping to prepare the bloodiest, most destructive war in history. 'Sutton comes to conclusions that are uncomfortable for many businessmen and economists. For this reason his work tends to be either dismissed out of hand as “extreme” or, more often, simply ignored.' - Richard Pipes, Baird Professor Emeritus of History, Harvard University (quoted from Survival Is Not Enough: Soviet Realities and America's Future).